Thomasina Miers is one of my food heros simply because of her passion for the food she creates. It should come as no surprise then that a visit to her restaurant Wahaca has been on my bucket list for a while! On a recent trip to London Mr W surprised me by announcing on the train journey there that he had booked us a table there for lunch for that day-happy Mrs W! 1.30 couldn't come quick enough & we made it to the Oxford Circus restaurant bang on time. We were shown to our table straight away & our waiter Carlos explained the menu to us. The menu (on paper & doubles as your place mat!) is easy to navigate. The sections are Nibbles, Street Food, Bigger Food & Sides oh & Desserts mustn't forget about them! Carlos also told us about the specials but I think we already knew what we wanted! The street food section is made up of small plates & they recommend 2-3 plates per person which is a great way to try lots of different dishes. However the Wahaca Feast was our choice at £34 for two to share they describe it as "A menu for adventurers to discover our favourites" & it sounded perfect for us! There is a decent cocktail menu also & pretty reasonably priced we felt. 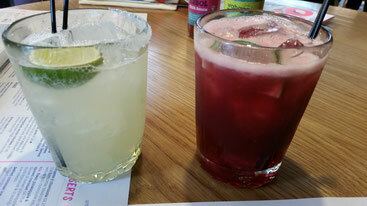 I went for the Hibiscus Margarita & Mr W chose the Classic Margarita both £6.95. Our food started to arrive beginning with some Chipotle Chicken Quesadillas, really tasty & slightly gooey with cheese we tucked in straight away. The rest followed shortly after-Pork Pibil Tacos (my favourite!) Juicy & delicious & topped with pink pickled onions. Summer Pea & Mint Empanadas-crispy & packed with flavour, Cactus & Courgette Tacos-unusual but equally good. Mr W's favourite was an amazing dish of Scallop & Shrimp Ceviche served with little crispy tortillas, absolutely divine! Last but by not least was the most heavenly Toasted Corn Bread with Chipotle Honey Butter that I could have happily eaten all by myself! 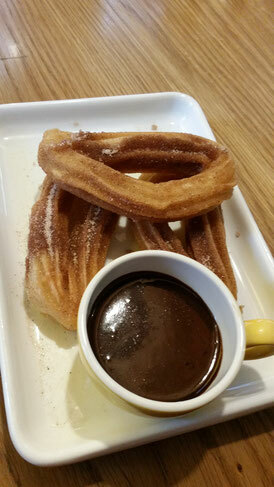 Included in this delicious feast were Churros for dessert-gorgeous little doughnutty morsels served with the richest smoothest choclate sauce & yes I did have room! 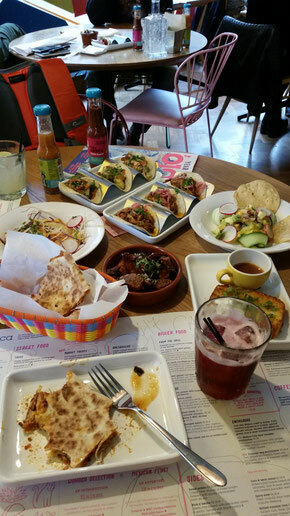 Wahaca is definitely the place to go for truly authentic Mexican food & considering its central London location the prices were very reasonable indeed! P.S. We did make it back to our hotel...just very slowly!